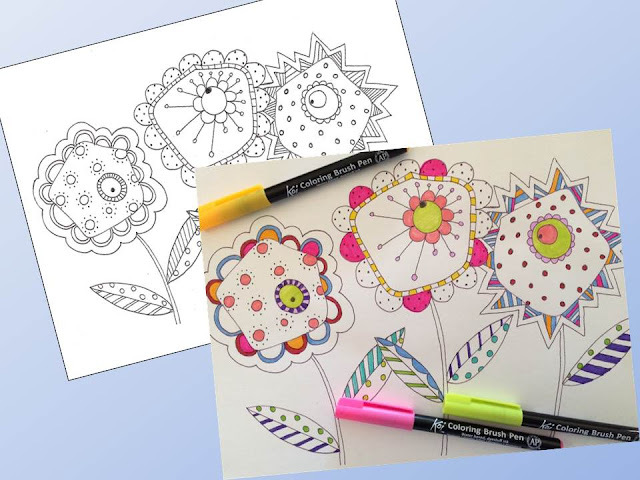 Upcycle-This: Coloring Pages are available for instant download! Coloring Pages are available for instant download! I enjoy drawing, painting, and coloring WAY more than I enjoy taking and uploading pictures of my creations to cyberspace. But I finally put my big girl pants on and listed almost 40 of my coloring book pages on Etsy. These pages are available for instant download, and can be printed as often as you like! Here is one that I started coloring myself, using my favorite... Koi Coloring Brush Pens! Seriously, these pens are the best! They go on smooth, like buttah. And if you're behind on your gift shopping, try printing a few different coloring pages on thick paper, toss in a set of colored pencils, or a set of markers and you've got yourself a nice little gift.